Real estate developer Century Properties Group, Inc. (CPG) capped off the first quarter of 2019 with a total of 24 buildings completed since the company’s first public listing in 2012. CPG has topped off 31 buildings overall, marking the home stretch in its target to complete 32 buildings by 2020. Completed projects include Century’s flagship Makati mixed-use development, Century City: the Gramercy Residences, Knightsbridge Residences, Milano Residences, Trump Tower Philippines, Century City Mall, and Centuria Medical Makati. 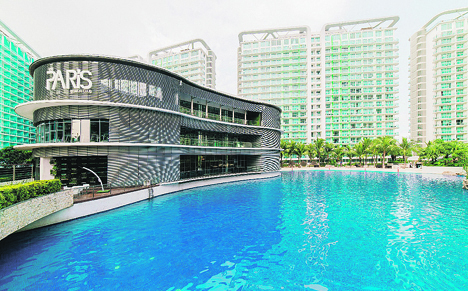 At Azure Urban Resort Residences in Parañaque City (Shown in photo), eight buildings have been completed, while five towers have been delivered at Acqua Private Residences in Mandaluyong City. The Residences at Commonwealth by Century, CPG’s eight-tower residential complex in Quezon City, has turned over four towers. Adding to the list is the Asian Century Center in Bonifacio Global City. Developed in partnership with Asian Carmakers Corporation, the 21-story LEED pre-certified and PEZA-accredited office building officially opened its doors last December.